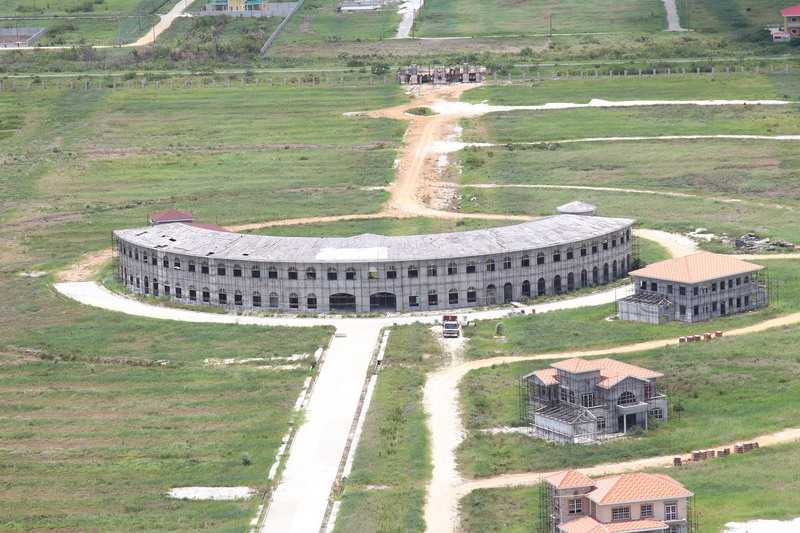 The CH&PA says it is in court seeking the rescinding of the 2014 sale of prime housing land to Brian Tiwarie of Sunset Lakes who later sold the swathe to a businessman affiliated to the controversial logging company, Baishanlin. However, a legal battle looms between the Central Housing and Planning Authority (CH&PA) and a local bank which had loaned monies to the new owners of the land. One week after an advertisement was placed in all the daily newspapers by the bank receiver announcing the land for sale, the Authority yesterday issued a press release disclosing that on July 20th last it commenced court proceedings to repossess the land. Nigel Hinds, the Receiver-Manager of Sunset Lakes Inc, in the ad invited tenders from local and foreign parties interested in purchasing 100 acres of land en bloc or less in the Providence area. The land is located within one mile and south west of the Guyana National Stadium. Under the previous PPP/C administration, businessman Tiwarie had signed an agreement via his Sunset Lakes Inc company with the CH&PA on February 7th, 2014 to purchase and develop the 100 acres of land at a cost pegged at $475 million. He paid a quarter of the sum and had six months to pay off the balance. In 2014, Tiwarie went into partnership with Chu Hongbo of Baishanlin where Chu would pay him US$8 million and develop the site. As part of the agreement, Tiwarie would also get to keep some of the house lots in the gated community for his personal use. However, Tiwarie took Baishanlin’s Chu to court in 2016 for the balance of US$4 million on the agreed purchase price. It is unclear if this matter has been settled. According to the CH&PA’s press release yesterday, on July 20th through attorney Robert Ramcharran who is attached to the law firm Luckhoo and Luckhoo, it initiated legal action in the High Court against Sunset Lakes Inc. as it relates to property situated at Parcel 130 Plantation Providence, East Bank Demerara. In the proceedings, the Authority is seeking a declaration that the claimant is entitled to rescind the Agreement of Sale and Purchase made and entered into between the Authority and the company on February 7th, 2014 with respect to the property situate at Providence. The plots were described as Zone: EBD, Block: VII, Parcel: 130 and Area: 100 Acres. Further, the Authority is asking the court to grant an order rescinding the said Agreement of Sale and Purchase and an order that the Authority refund to the company the of sum of $458,180,000, the value it paid for the land less the 10% payable as a penalty for the alleged breach of the terms and conditions of the said agreement of sale and purchase. Other orders being sought include one to direct the Registrar of Lands to recall and cancel Certificate of Title No. 2014/3415 with respect to Sunset Lakes Inc and another directing the Registrar of Lands to re-register the said land in the name of the Claimant. Further the court is also asked to direct the company to give up the vacant possession and occupation of the said land. Last week, Hinds had told Stabroek News that the CH&PA had no business in the matter since Tiwarie had sold the land and the new owners have legal title for the land and were not in any agreement with the Authority. Hinds had revealed that he was appointed receiver by a local bank which gave a loan to the principal owners of the 100 acres and are now seeking to recoup their money. The loan was granted over the last two to three years. He expressed the view that the CH&PA had no say as from the documents he has seen the land is legally titled to the principal shareholders of Sunset Lakes. He had said that the land was indeed purchased by Chu Hongbo, one of the owners of Baishanlin, but in that same agreement of sale it was then transferred to Sunset Lakes, which was originally owned by Tiwarie. As to comments that were made by Chief Executive Officer of CH&PA, Lelon Saul that the land will be repossessed since the terms of the agreement as it pertained to the development of the land were not met, Hinds had pointed out that the present owners of the land had entered into no agreement with the Authority. “What is their locus standi?” Hinds had questioned and added that Sunset Lakes has a clean transport and that the CH&PA was dealing with Tiwarie. In 2014, Chu’s Baishanlin had promised some 400 luxury homes on its 100-acre gated community at Providence. However, with debts piling up and regulators clamping down on it, the project went bust. The planned housing scheme appears to have taken on significant local debt. At what was dubbed the New Life Community project, houses were to start at $28 million and go all the way to $105 million.